In this powerful, eloquent story of his return to the classroom, a former teacher offers a rousing defense of his beleaguered vocation Perhaps no profession is so constantly discussed, regulated, and maligned by non-practitioners as teaching. The voices of the teachers themselves are conspicuously missing. Defying this trend, teacher and writer Garret Keizer takes us to school—literally—in this arresting account of his return to the same rural Vermont high school where he taught fourteen years ago.Much has changed since then—a former student is his principal, standardized testing is the reigning god, and smoking in the boys’ room has been supplanted by texting in the boys’ room. More familiar are the effects of poverty, the exuberance of youth, and the staggering workload that technology has done as much to increase as to lighten. 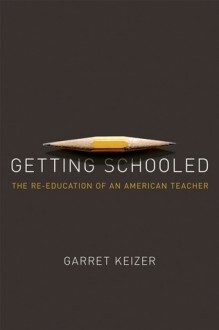 Telling the story of Keizer's year in the classroom, Getting Schooled takes us everywhere a teacher might go: from field trips to school plays to town meetings, from a kid's eureka moment to a parent's dark night of the soul.At once fiercely critical and deeply contemplative, Keizer exposes the obstacles that teachers face daily—and along the way takes aim at some cherished cant: that public education is doomed, that the heroic teacher is the cure for all that ails education, that educational reform can serve as a cheap substitute for societal reformation.Angry, humorous, and always hopeful, Getting Schooled is as good an argument as we are likely to hear for a substantive reassessment of our schools and those who struggle in them.